Bleass are fairly new on the iOS music app scene but are definitely showing some promise. Their first app, Bleass Groovebox, is a tidy little groove maker that is developing nicely and could grow to fill the void left by the disappearance of Figure from the App Store. Bleass Delay, their latest app, is a deceptively simple looking Audio Unit Delay effect. The app has a nicely designed User Interface with the 3 main sections laid out with lots of controls at your fingertips. Bleass Delay can be used as a simple delay/tape delay style effect but can also expand in to new sonic dimensions with the Frequency/Pitch shifting, 2 Filters, LFOs and Stereo Phase options. Main Delay Line which will sync nicely to bpm if desired. There is also Ping Pong stereo delay button. Each panel has an LFO that can be used to further stir things up. For example using the LFO in the Delay panel you can have the delay time sweep subtly or wildly. 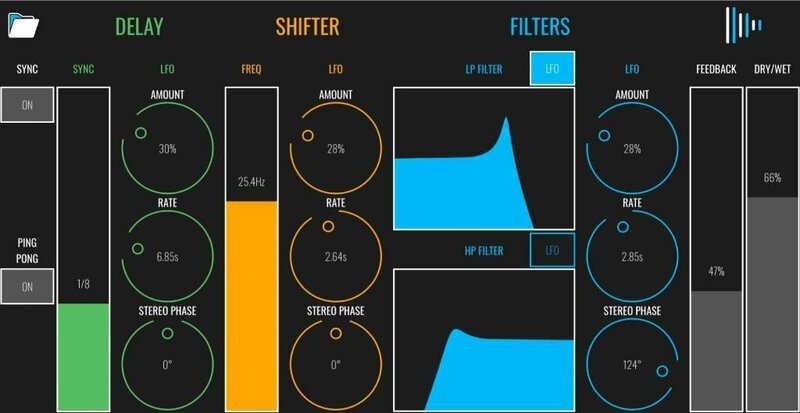 Another example is using LFO on the Filters to get some nice filter sweeping delays. The 3 main panels also include a Stereo Phase control that allows you to scatter your source material further around in the Stereo Field. It is superb on electronic drums I got lost in Bleass Delay for some time running SeekBeats and Sector though it. Bleass Delay is probably not best suited if you are looking for a simple workhorse delay to add to a guitar, though it can do that. It is more of an experimental delay suitable for sonic explorations, sitting in the same ballpark with ApeDelay by Apesoft, Kosmonaut by Bram Bos and Elastic FX by Oliver Greschke. Bleass Delay costs an extremely reasonable $4.99 and is well worth adding to your sonic palette if you enjoy warping your sounds in new and unexpected ways.